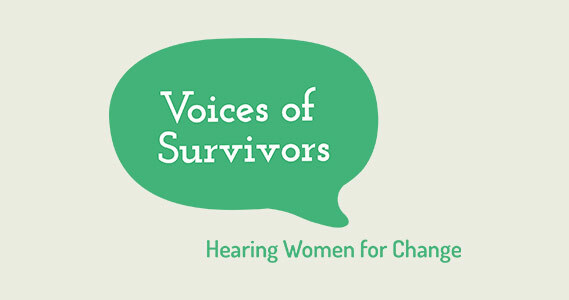 We would like to invite you to attend The Voices of Survivors Launch Event. We are pleased to announce that Baroness Beverley Hughes of Stretford, Greater Manchester’s Deputy Mayor for Police and Crime will be our keynote speaker. The launch event will be an exciting opportunity to hear more about the project and will provide a unique chance to meet a wide range of women and representatives from women’s organisations from across all 10 Boroughs of Greater Manchester and to sign up to become part of the network of frontline organisations. The event will be taking place on Wednesday 13th September 2017 in the Main Hall at Methodist Central Buildings, Oldham Street, Manchester, M1 1JQ from 1pm-4pm. Registration, refreshments and sandwich buffet will commence at 1pm ready for a 2pm start. Friends, colleagues and anyone you feel may be interested are all welcome. 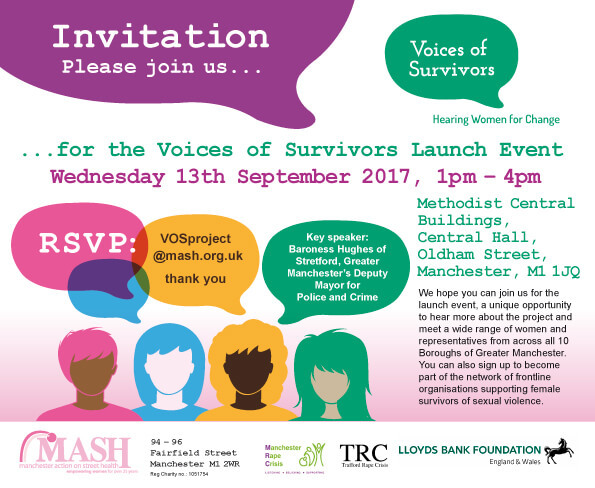 Please RSVP to: VOSproject@mash.org.uk to let us know. Feel free to get in touch if you have any questions in the meantime, otherwise we look forward to seeing you there!